Condition: Restored. Now a major tourist attraction. Ownership / Access: Shannon Heritage. Notes: Bunratty Castle is a large 15th-century tower house in County Clare, Ireland. It is located in the centre of Bunratty village , by the N18 road between Limerick and Ennis, near Shannon Town and its airport. The castle and the adjoining folk park are run by Shannon Heritage as tourist attractions. 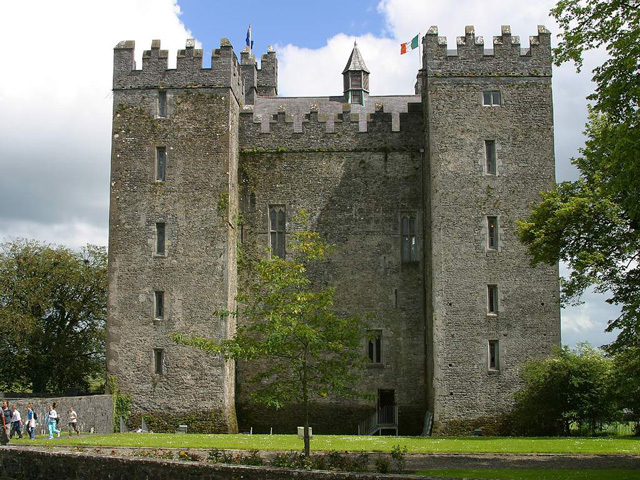 Today, the castle is a major tourist attraction, along with "Bunratty Folk Park". Both the castle and Bunratty House are open to the public. The castle is famous for its medieval banquets, offered since 1963, at which the "Bunratty Castle Entertainers" perform today. "Bunratty Folk Park" is an open-air museum featuring around 30 buildings, including the Ardcroney Church Of Ireland church, moved here and reopened in 1998.Today, the castle is a major tourist attraction, along with "Bunratty Folk Park". Both the castle and Bunratty House are open to the public. The castle is famous for its medieval banquets, offered since 1963, at which the "Bunratty Castle Entertainers" perform today. "Bunratty Folk Park" is an open-air museum featuring around 30 buildings, including the Ardcroney Church Of Ireland church, moved here and reopened in 1998.